The roomy 700E will be best towed by a ute or 4WD SUV. The kitchen is a stand-out. Cabinetry in the 700E is well-made. Premium fixtures in the bathroom. The revised east-west bed layout. Plenty of storage options in here. Life is full of surprises; nice ones and not-so-nice ones. My surprise when I reviewed the Kea Karavan 700E was a very nice one. I had seen earlier versions that were not so impressive though, created by different manufacturing regimes in the days before the RV Manufacturing Group (RVMG) came into being. This is the company that now manufactures all the new RVs for the rental and sales divisions of Tourism Holdings. 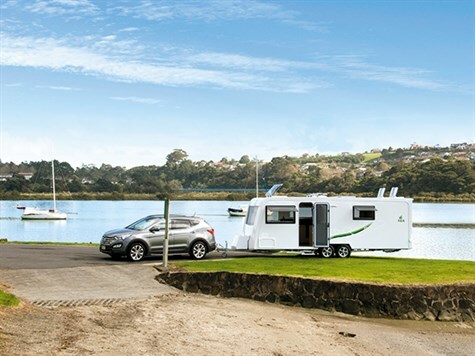 Basically any new motorhome you rent from a Tourism Holdings owned company (Britz, Kea, Maui, United) or purchase new from the RV Supercentres in Auckland or Christchurch will have been made by RVMG. Caravan manufacture was not a comfortable fit in this new setup so it was moved to a separate privately owned business run by Glenn Howe. His brief was to take all the caravan manufacturing equipment from the old CI Munro plant in Hamilton and Kea in Auckland; jigs, moulds, plans etc, and shape them into a product range to be sold through the RV Supercentres in both Auckland and Christchurch, as well as through other dealers nationwide. Glenn has enthusiastically embraced this new caravan-building challenge, and my first impression of his latest creation, the new 700E; an extremely well prepared and presented product. As Glenn described it; "The first version released had the 'Aussie layout', with a north-south island bed up front and a dinette amidships, opposite the kitchen. 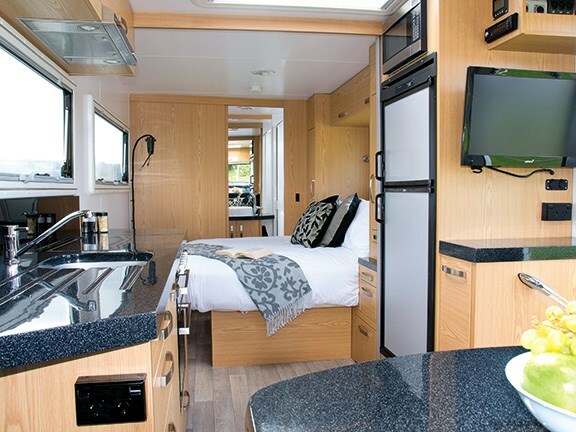 "The layout in the caravan being reviewed has the traditional kiwi layout with a large 'U' shaped lounge up front. The 700E designation indicates the caravan has an overall body length of seven metres. The interior layout includes a permanent 'east-west' island bed." There are two other sizes in the range: a 6.6 metre 660 and a 7.7 metre 770. In the 'E' range the lounge side settees in the 660 are shorter and in the 770 they are longer. Otherwise the layouts are the same for all three lengths. The 700E caravan body is mounted on an Alko tandem axle galvanised steel chassis with independent suspension, electric brakes, and heavy-duty alloy wheels fitted with 185 x 14 tyres. Four corner steadies are fitted as standard. It's a robust set up suitable for the weight of the rig; tare weight 2050kg and GVW of 2500kg. These weights are beyond the range of a family car so a medium to large pick-up or 4WD will be needed for towing the 700E. A quick walk around the 700E reveals a couple of features at odds with other Kiwi-built caravans. The LPG bottles are mounted on the chassis 'A-frame' at the front of the 'van, and are covered with a neat fibreglass moulding that meets the gas regulation of being in a separate well-drained compartment. 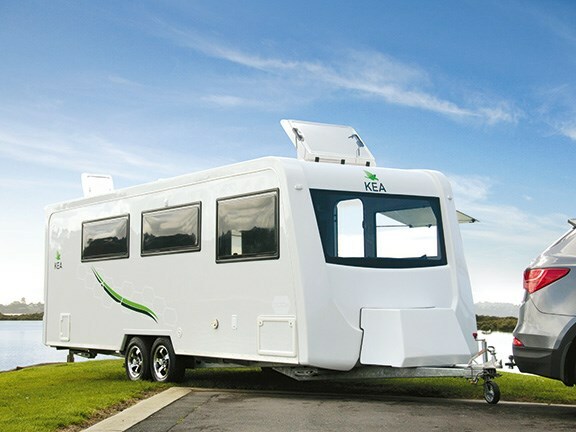 The 700E also differs from other New Zealand manufactured caravans in its method of construction. Glen employs the more recent foam sandwich construction method to build the floor, roof and walls rather than the traditional timber frame method. The floor is 60mm thick with RHS steel framing, plywood sheathing either side of the polystyrene insulation core. The walls and roof are 30mm thick with fibreglass sheet exterior cladding and prefinished plywood on the inside. This is the preferred construction method overseas and is gaining ground with constructors here in New Zealand. This method certainly produces a pleasing result. Perfectly flat sides with the one piece front, rear and roof moulding over-lapping where they join the sides; a design detail that suggests there is no chance of dust or water entry through the body seams. Cabinetry surfaces are finished in a restful pale honey oak coloured laminate that contrasts nicely with the black bench-tops and the striking black and silver-grey upholstery fabric. The overhead lockers are a well-proportioned, rectangular shape and fit comfortably with the interior theme. Careful attention to detail is evident with the discreet placement of the heating vents in the toe-kicks and the way the range-hood is flush fitted into the cabinetry. It is an appealing mix of modern and traditional designs. 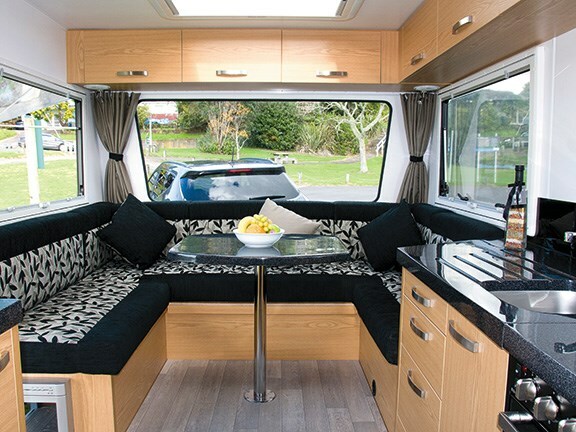 The club lounge at the front is a feature traditionally revered by Kiwi caravanners and this one in the 700E is a cracker. 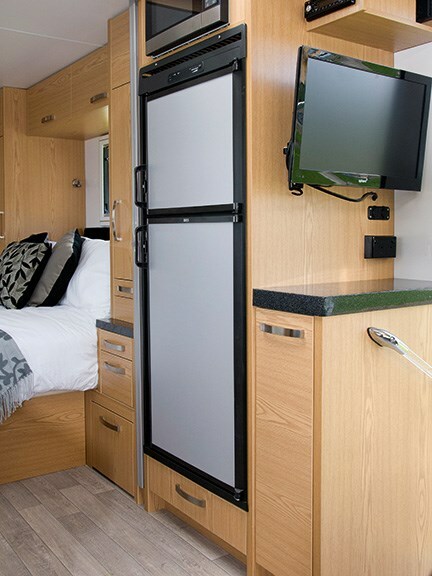 It's spacious, offering comfortable seating for six whether dining or socialising and can be converted to a large double bed at nighttime if needed. The side settees are long enough that you can put your feet up to read or watch TV. Entertainment is not forgotten. The 22-inch Led TV plays DVDs and has a separate satellite receiver for Freeview and Sky channels (you need a Sky card for this) via the standard Winegard windup satellite dish. An AM/FM stereo radio keeps newshounds up to date and plays CDs for music buffs. Caravans of this size are regarded by their owners as a home away from home and in some cases, as home itself. As such they are judged on the usefulness of their kitchen. The 700E's kitchen ticks all the boxes. The kitchen bench made of black, stone chip resin (with splashback to match) has draining grooves moulded into the working surface and the dark moulded cover over the cooktop fits so well you barely notice it. The 1450mm long window above the bench allows the cook to keep an eye on activities outside whilst cooking up a storm. Hafele soft close drawers and doors, as well as two pullout pantries, add a touch of class. Gone are the days when RV owners will accept a slab of foam with a plain cotton cover as a bed mattress. Today bedtime comfort is demanded. The offering in the 700E; a Sleepyhead queen size pillow topped inner-sprung mattress over a pull out orthopaedic slat base should satisfy most. Clothes and personal items are stowed in his 'n her hanging lockers and bedside drawers with the overflow going in the overhead lockers. The window behind the bed is well clear of the pillows so sitting up for your morning cuppa is no problem. There is room for bulky items to be stored under the bed. 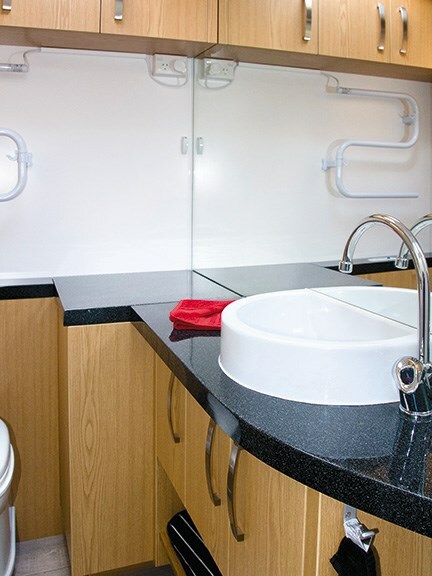 One look at the 700E bathroom and you'll forget the campground ablution block facilities. A wonderful shower – a one piece 'no leak' moulding with the wooden floor grate adding a nautical touch – is closed off with a rollaway screen. The hatch in the corner of full width bathroom black bench top (which matches the kitchen) lifts to reveal a small 2.5kg washing machine. And the full width mirror above the bench makes the room seem bigger than it is. How does it cope freedom camping? Not too badly because the 700E comes with fresh and grey water tanks (110 litres each) as standard with an additional 110 litre fresh water tank as an optional extra. A 150-watt solar panel is fitted as standard to help top up the 120 amp/hr house battery. In keeping with the rustic camping theme there is an exterior bayonet fitting for connecting a gas BBQ to the LPG supply, as well as an exterior hot/cold shower. The Kea Karavan 700E is 'an extremely well prepared and presented product'. As I discovered during this review, it is also comprehensively equipped. 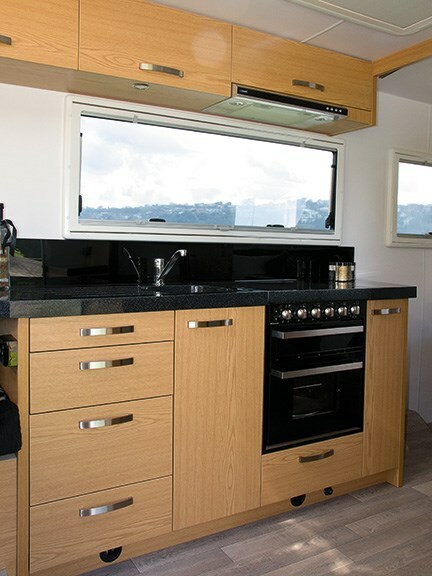 If you are in the market to buy a larger size caravan make sure you obtain the full specification for the model that suits you. I think it will stand comparison with anything else available in New Zealand. The kitchen. All the gear you need and space to use it. The club lounge. Well executed traditional kiwi caravan lounge. The body panels. Quality GRP mouldings neatly fitted together. Fixed front window. I'd prefer one that opens.